With the recent mainstream media hype, however, one would be tempted to believe that such an independent study has finally taken place proving that the MMR vaccine is not linked to autism. However, brief research into the allegedly independent “review panel” of the new darling of the month “MMR is not related to autism study” reveals that this is not the case. For instance, the organization that conducted the study is the Lewin Group, a corporate healthcare consulting firm based in Falls Church, Virginia. The Lewin Group works with a wide range of players in the medical establishment. Most notably major pharmaceutical companies like Pfizer, Johnson & Johnson and Novo Nordisk among others. It should be noted that at least two out of these three corporations are not only vaccine proponents, they are vaccine manufacturers. The Lewin Group also works with a number of major medical and pharmaceutical associations and organizations like the Pharmaceutical Research and Manufacturers of America association. In addition to working with the federal, state and local governments, the Lewin Group works with avariety of foundations such as the Robert Wood Johnson Foundation and the Heritage Foundation as well as a large number of hospitals, health systems, and healthcare providers. The Lewin Group is especially involved in major medical insurance programs like Blue Cross Blue Shield, Health Now New York, LA Care Health Plan, Kaiser Foundation Health Plan and Wellcare among many others. In addition to these big connections to pharmaceutical companies and the medical establishment, the mainstream media attempts to present the Lewin Group as being free from the influence of their own clients and associates. In addition, the mainstream media conveniently leaves out the fact that the Lewin Group is not independent in as much as it is owned by the nation’s largest health insurer, United Health Group. Interestingly enough, United Health has seen its business grow over the last year due to the surge in customers forced into the market under Obamacare. It is thus no small wonder why United Health lobbied so hard to even eliminate a “public option” from the Affordable Care Act during the stage in which the bill was being debated. United Health lobbyists used work provided by the Lewin Group as a basis for its argument that providing a public option would kill the private insurance industry. Those few democrats in the U.S. Congress that disagreed were apt to point out the conflict-of-interest between the Lewin Group’s findings and United Health’s desires, referring to the Lewin Group’s work as “so-called analysis” and “suspect.” It is thus highly unfortunate that the Lewin Group’s conflict-of-interest and shady findings could be pointed out in 2009 but not in 2015. United Health’s program through subsidiaries like UnitedHealthcare, also sought to “increas[e] awareness of the diseases and promot[e] convenient access points.” With all of this information correctly understood, it should be clear that the Lewin Group is no independent observer. To present it as such is at best dishonest and at worst part of a coordinated campaign to promote dangerous pharmaceutical products that have been demonstrated to cause serious damage to adults and especially children. While legitimate research has demonstrated the harmful effects of vaccines, particularly the MMR shot, it has been demonized and mocked; the researchers have been persecuted by whorish media outlets, unrestrained corporations and narcissistic medical fanatics. Meanwhile, hack studies and purchased scientists are presented as the epitome of scientific development. 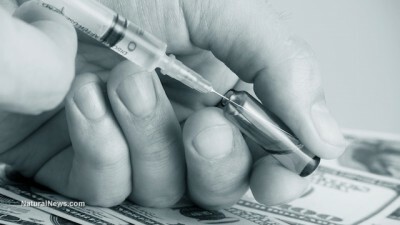 The truth is that there has never been a study proving vaccines safe or effective that was not connected to a pharmaceutical company or a vaccine maker. The mainstream media’s recent jaunt has yet to change this fact. Brandon Turbeville is an author out of Florence, South Carolina. He has a Bachelor’s Degree from Francis Marion University and is the author of six books, Codex Alimentarius — The End of Health Freedom, 7 Real Conspiracies, Five Sense Solutions and Dispatches From a Dissident, volume 1and volume 2, and The Road to Damascus: The Anglo-American Assault on Syria. Turbeville has published over 500 articles dealing on a wide variety of subjects including health, economics, government corruption, and civil liberties. Brandon Turbeville’s podcast Truth on The Tracks can be found every Monday night 9 pm EST atUCYTV. He is available for radio and TV interviews. Please contact activistpost (at) gmail.com. Heather Callaghan is a natural health blogger and food freedom activist. You can see her work at NaturalBlaze.com and ActivistPost.com. Like at Facebook.